My daughter has this and she absolutely LOVES it! 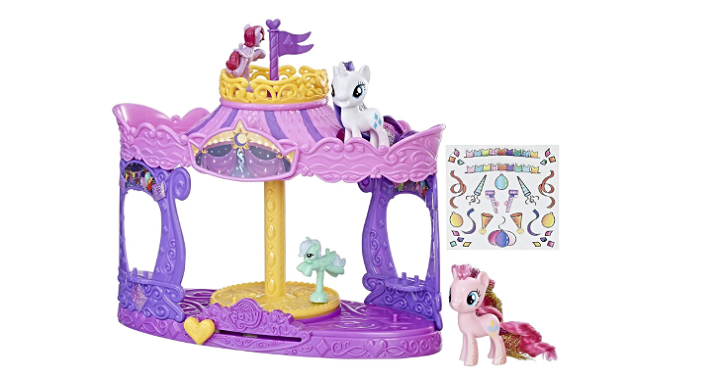 Right now on Amazon, you can get this My Little Pony Musical Carousel with Pinkie Pie and Rarity for Only $27.57 Shipped! (Reg. $47). Slide the button and watch the cute little ponies spin to the music. This set comes with a white 3-inch Rarity pony toy and a pink 3-inch Pinkie Pie toy so kids can pretend they’re going on friendship adventures around Equestria! The ponies in this set are decorated in glitter, and the Pinkie Pie and Rarity dolls have glittery streaks in their long, beautiful hair. A great birthday or holiday gift for kids ages 3 and up, fans of My Little Pony will recognize the carousel from scenes in My Little Pony: The Movie and enjoy reenacting friendship scenes or creating their own with this musical merry-go-round! Set Includes carousel, 2 pony figures, 2 carousel ponies, sticker sheet, 3 paper goods, and instructions. Ages 3 and up.